Protect your home and protect your family with a quality roofing system from Steel King Construction. As an Alaskan owned and operated construction company we know what it takes for a roof to stand up to Alaskan weather. When working with Steel King Construction you can be sure you will get the best roofing in Alaska because we install every roof like it’s our own. Based out of Anchorage and serving all of Alaska, Steel King can handle any and all of your roofing services needs. We believe in proper installation AND maintenance of roofs for superior performance and quality that lasts. For existing roof we can inspect and point out any small issues so they can be repaired by roofing specialists before they become big problems. Don’t leave such an important system of your house, the roof, to chance and passage of time. Let the roofing experts at Steel King Construction keep your roof functioning at peak performance throughout it’s lifespan. All roofing penetrations. These include chimneys, skylights, vent stacks, and even cables and satellite dishes. Drip edge and gutters. An important piece of the roofing puzzle to keep water moving in the right direction- off your house. All areas of flashing such as dormers and roof to wall transitions. When missing or improperly installed these transitions can be a route for water penetration that can travel long distances into your home before being detected. We can also inspect your attic space for proper ventilation and insulation. What may appear to be a leak or faulty roof could be linked to poor attic performance. Trust Steel King Construction to cover all facets of roof inspection and maintenance for a long lasting and high performing roof. Roof Maintenance and Repair- Do I need a new roof? For your convenience here are some telltale signs of a roof that needs professional service and further investigation. Warped, cracked, curled, or bald shingles. These are signs of excessive wear and age or damage. Poor performing shingles means poor performing roof. Evidence of nails/screws popping in older roofs. Protruding fasteners are an entry point for moisture. Age over 20 years or your neighbors are getting new roofs. Many homes in the same neighborhood will have similarly built and aged roofs. If your neighbors are getting new roofs you should assume your roof may need the same attention. Better to be safe than sorry. Moss may be an indicator that your roof needs at least some maintenance performed. Moss can hold moisture against your roof allowing it to seep in under your shingles causing damage. There are many materials you can use for your Alaskan roof. We at Steel King Construction will do our very best to inform you of the benefits and drawbacks of each type specific to your home and budget. 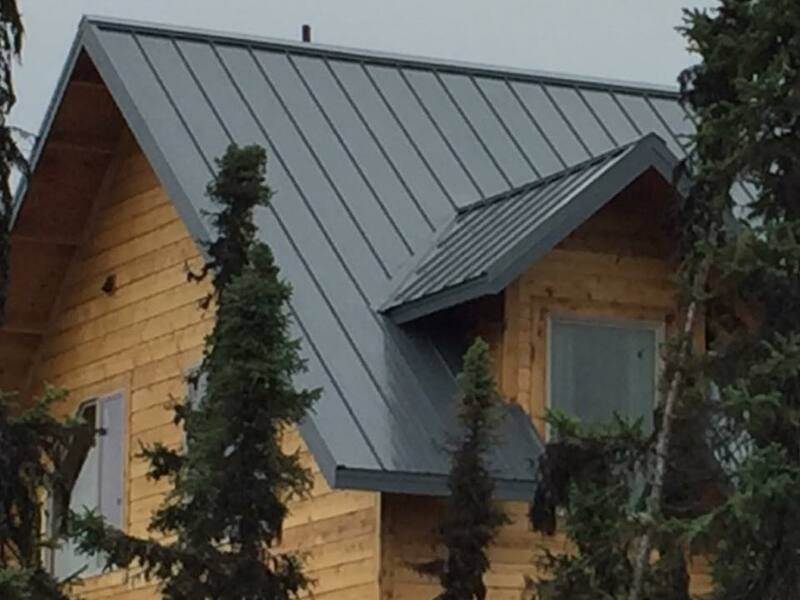 Alaska has a challenging climate for roofs of all types and we have found metal roofing to often times be the best solution for top performance at an affordable overall price. Regardless of what you choose we will choose the right product and install it with expert precision so you can have a quality roof that will perform for many years to come. Asphalt shingles. Generally more affordable and available in wide range of colors and appearance. Metal roofing. Tough, economical, and increasingly available in an array of colors and appearances. Slightly higher initial cost but long term value. A stylish choice for the climate of Alaska. Cedar shingles. A “green” and renewable resource option cedar shingles are attractive and durable. Slate. A more expensive option, nothing matches the look and durability of slate. Expertise required for installation. ​Many more options are available including synthetic slate, concrete and clay tiles, solar shingles, green roofs, and the list goes on. Call Steel King Construction to review all your options with an Anchorage roofing specialist. When the time comes for a reroof or if you need a roof on a new construction home, call Steel King Construction. The best roofing company in Anchorage Alaska. ​We ensure quality by having every project overseen by one of our highly experienced owners. Their eye for detail and pride in craftsmanship will give you a properly installed and functioning roof on time, every time. ​We use top quality materials for every project because our roof installation is performed like we are installing for the home of the most detailed Anchorage roofer, our own.